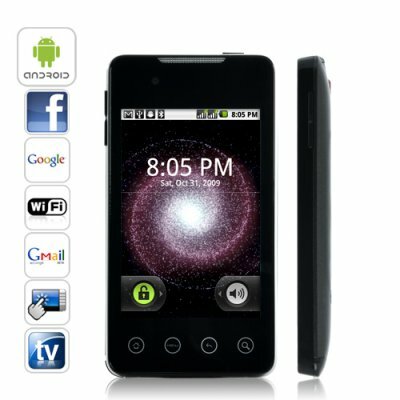 Successfully Added Antares 3.5 Inch Touch Dual SIM Android 2.2 Quadband Smartphone to your Shopping Cart. Antares, one of the brightest stars in the universe, making it the perfect name for this amazing phone. Because it combines the best of both worlds. A cutting edge Android 2.2 OS with the robustness of a dual-SIM quadband GSM phone so you can use it all over the world which will brighten up your life with communication and productivity gains you can't even begin to imagine. The Antares Android Phone comes with all the features and tools to help you manage your hectic lifestyle, be entertained, and stay connected with the important components of your social media world: family, friends, co-workers, clients, you name it. The Antares Android Phone uses the most stable version of the popular Android operation system, 2.2 which along with the pre-installed Android Marketplace gives you access to tens of thousands of apps, most of them free. Download and use the popular Android Facebook Application which keeps you connected with friends and family and automatically syncs your contacts' Facebook photos into your contact list. What's more, since this is a Google product, you'll experience seamless syncing with the Gmail, Google Calendar, and all things Google. Remember those horrible memories of trying to sync your contact information with a special cable (that you almost always had to buy separately) or a cradle that was cumbersome? And then there was the special software you had to use that was poorly written, took forever, and always crashed? Those days are long gone. Let's take contact syncing with Android 2.2 for example. Just enter you Google id and password, hit sync and all your Gmail contacts are automatically loaded into your phone. Update your Gmail contacts, and your phone contact list is updated as well. Aside from being the world's best mobile gmail client so you can get personal and work emails, contacts and calendars- all in one interface, The Antares also gives you access to live and animated wallpapers for true customization, an improved photo album with 1-2-3 click, upload and share so all the world can see your photos be it Facebook, Twitter, Gmail or MMS. Plus let's not forget you get access to Google maps, worldwide GSM connectivity (850 / 900 / 1800 / 1900 MHz), a rock solid MP3/MP4 player that plays all the web's hottest audio and video file formats, and so much more. The measurement by which we gauge greatness is in the details. The quality finish, the thoughtful interface, and surprising touches like a pull out stand so you can place the phone in an upright position which serves as an awesome digital photo frame or mini video screen. The Antares Android 2.2 Phone is designed to truly shine! As Chinavasion continues its lead in the online marketplace, our supplier relationships and buying power increases as well. That's why you'll find, that you will NOT find an Android 2.2 smartphone of this caliber for such a low wholesale price anywhere else. Don't believe us, just Google "Android 2.2 Phone" it for proof. The new Antares smartphone is in stock now, ready for express delivery and comes with our full 1 year warranty. From the online leader in wholesale Android phones, Chinavasion! Why does my computer keep asking for drivers when I connect my phone/tablet PC with it via the USB cable? ... it's a very complete product..